Does someone you know love roses? Then they'll love this lush, fresh pink medley of blossoms mixed with a generous helping of fragrant roses. Delivered in a glass sweetheart vase, it's a pleasing bouquet that's perfect for a birthday, anniversary or any day of the year. 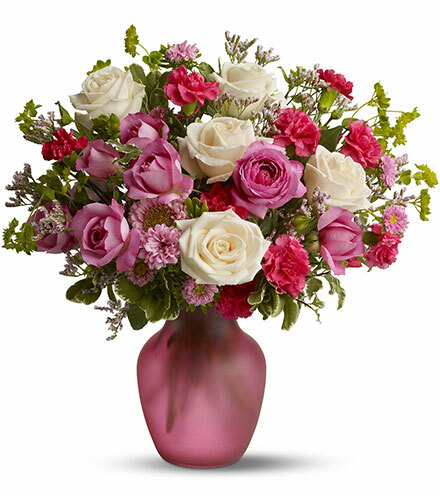 Roses and spray roses are mixed with fresh flowers such as miniature carnations and Matsumoto asters - in shades of white and pink - and delivered in a glass vase.